The ants need to plan the Blowout Bug Jamboree! But how can they build a thrilling carnival ride for the festival if they don't know how many bugs will come, or how big those bugs will be? This is a colorful and fun-filled introduction to nonstandard measurement, comparison, and organizing and representing data. 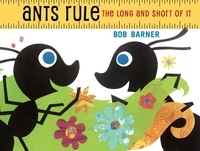 As caterpillars, butterflies, and other insects are measured and compared in lengths of ants, an amazing plan unfolds. Just in time for the jamboree, the ants put the final touches on the perfect roller coaster, seen in a deluxe gatefold spread.